Content: There is talk of torture and beatings, but nothing graphic. It would be in the middle grade (grades 3-5) section of the bookstore. This slim novel (sort-of; it’s touted as a biography, and it is biographical, but I’m not sure it really counts as a “biography”) depicts the childhood and early life of noted Cuban poet Juan Francisco Manzano, who was, for much of his life, a slave. Although the verse is spare, Engle doesn’t hold anything back: Juan was not only taken from his parents to be a pet of his first master, he was denied his freedom (his first master willed him his freedom at her death) and sold to a horrible woman who beat, tortured, and nearly killed Juan. 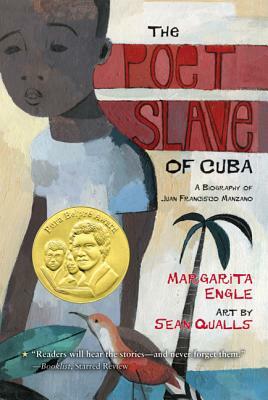 The poems/chapters are told from varying points of view: Juan, his parents, his owners, and one of his master’s sons. They tell of his desire to learn, to express himself, and the punishments he received because of them. It’s heartbreaking. Engle has captured not only the difficulties that Juan faced in his life, but his capacity for hope, for happiness, and for creativity. Her poetry is beautiful, and she allows Juan’s story to come through. Content: There’s some drug use and drinking, mostly by adults. It’s in the Teen Section (grades 9+) at the bookstore, but I’d give it to a 7th/8th grader who is interested. Blade Morrison is the son of an aging rocker, whose career has been in a steady decline for most of Blade’s life. Drugs, alcohol, and Blade’s mom’s death all contributed to the decline, and Blade has lost patience with his father. Especially when he shows up, mostly naked, at Blade’s graduation. It also doesn’t help that his girlfriend’s father has forbidden her to see him. 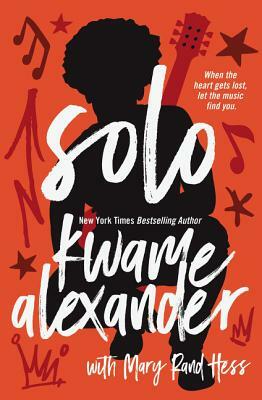 So, when a long-kept family secret comes out and Blade ends up half way across the world, he is given a chance to figure out his own life and maybe figure out his relationship with his family. That said, Alexander and Hess’s poetry is lovely, and I loved how they incorporated music. There’s a line, near the end of the book about how, in spite of everything, music is something that binds us and brings us together, and that resonated so very much with me. Rock-n-roll, R&B, jazz, classical… music is universal and helps heal, and Alexander and Hess captured that perfectly. Which, in spite of the little complaints I had, really made this book, well, sing. Content: There’s some tough subjects dealt with here, but there’s nothing graphic. It’s in the Middle Grade (grades 3-5) section of the bookstore. I’ll say this up front: I’m uncomfortable with this book. Not because of the subject matter (though I do have to admit that I’m tired of Civil War slave narratives. Not because they’re not important, but because it seems to be the only African American story publishers want to tell.) but because it’s a white woman telling the story. I’m not going to say she shouldn’t be telling this story, but rather because I think this story would have been better served being told by a person of color. That’s not to say it was a bad story; it was okay, as far as slave narratives go. 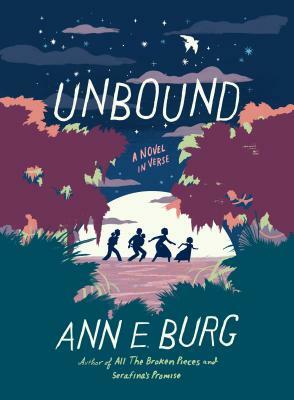 Berg was trying to tell the story of a community of runaway slaves in North Carolina who settled in the Great Dismal Swamp (where native peoples had settled for thousands of years), living there in order to be free from slavery. But that’s not really the story she ended up telling. It was more of the disgruntled slave who couldn’t keep their place and so they had to leave narrative. Which is fine, but not exactly the narrative of the people in the Great Dismal Swamp. It’s not that it’s a bad book. It does tell a story at a level that children can understand. It does have non-white characters. It does talk about the less desirable things in American history. I just wish it were, well, More. Review copy pilfered off the ARC shelves at work. Content: There’s a wee bit of romance and some difficult situations with bullying and divorce. Give it to readers ages 10 and up. It will be in the middle grade (grades 3-5) section of the bookstore. The thing that I admire most about The Crossover was the style of it all. The way the poetry flowed on the page, the way that Alexander captured the rhythm of his characters in the ebb and flow of the poetry. And lest we think lightning only strikes once, Alexander gives us Booked, repeating much of what I loved about his first book. 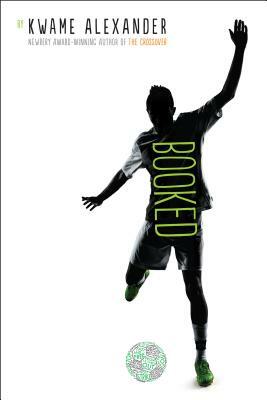 Instead of basketball, this time Alexander immerses us in the world of competitive soccer. Nick and his best friend Coby are extremely good, playing not only in competitive leagues but also for fun on the weekend plus the FIFA video game. It’s their whole life. Except, for Nick, it’s not that simple. His parents are going through a rough patch, and they separate so his mother can go help train a horse for the Kentucky Derby. His dad is a linguist and insists that Nick read this dictionary that he wrote, something that Nick resents. And, he’s bullied by these twins at school. There are bright spots: his mother makes him take this etiquette class, but there’s this girl he kind of likes (and who kind of likes him back). And the librarian at school is WAY cool. So, maybe Nick can find a balance in his life after all. Not only is the story complex and compelling, I again, adored the poetry. Alexander has a way of making something as “stuffy” as poetry accessible and cool, which is wonderful. I loved how the voice and the form of the poems changed depending on the characters (Nick was ostensibly our narrator, but there were appearances from other characters as well). I loved the footnotes with definitions of some of the bigger words (including snarky asides). It’s fun and engaging, and yet Alexander tackles tough subjects like bullying and divorce with grace and ease. It’s not just a smart way to get reluctant readers interested in books or unsure kids interested in poetry. It’s a fantastic book. Review copy sent to me by the publisher rep. Content: There isn’t anything objectionable, and it’s a novel in verse so it’d be appropriate for the younger readers. Good for conversation as well. It’ll be in the middle grade (grades 3-5) section of the bookstore. Mimi Yoshiko Oliver is obsessed with space. It’s 1969, the height of the space race, and she wants to be an astronaut. The problem? She’s a girl. No one takes her desire seriously, especially in her school in Vermont. It also doesn’t help that she’s Afro-Asian, one of the only people of color in an all-white community. to her struggles to make friends. There are lots of stories about racism in the south in the 1960s. It was actually quite refreshing to be reminded that even northerners had issues with civil rights. It’s a lovely novel in verse, as well. 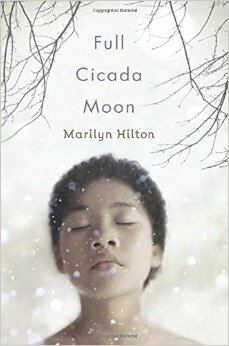 Hilton captured Mimi’s sense of wonder an awe at the world around her as well as her desire to go into space. It wasn’t overly detailed, something which might bother some readers but I found I didn’t mind. Perhaps it’s because I’m older, and I remember what it was like (sort-of). But, I also think it was a conscious choice on Hilton’s part to make it more accessible to those reading it. So, on the one hand, it’s historical fiction. But the other, it didn’t really feel all that much like it. Even so, I thoroughly enjoyed spending time with Mimi and her family, as they adjust to a new home, broaden their horizons, and have a memorable year.